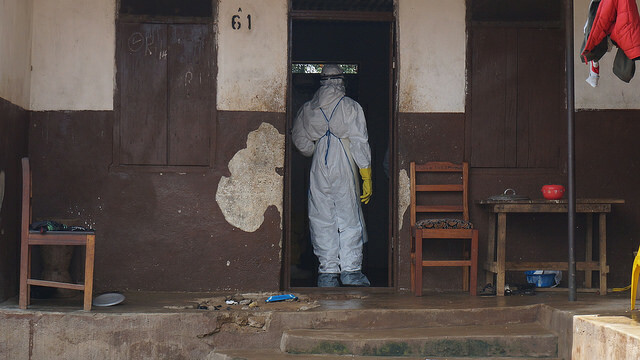 WASHINGTON, Sep 08 (IPS) - The U.S. military over the weekend formally began to support the international response to the Ebola outbreak in West Africa. Yet already multiple concerns have arisen over the scope of the mission – including whether it is strong enough at the outset as well as whether it could become too broad in future. President Barack Obama made the first public announcement on the issue on Sunday, contextualising the outbreak as a danger to U.S. national security. "We're going to have to get U.S. military assets just to set up, for example, isolation units and equipment there to provide security for public health workers surging from around the world," the president said during a televised interview. "If we don't make that effort now … it could be a serious danger to the United States." While the United States has spent more than 20 million dollars in West Africa this year to combat the disease, Washington has come under increased criticism in recent months for not doing enough. Obama is now expected to request additional funding from Congress later this month. The military's response, however, has already begun – albeit apparently on a very small scale for now, and in just a single Ebola-hit country. A Defence Department spokesperson told IPS that, over the weekend, Secretary of Defence Chuck Hagel approved the deployment of a "25-bed deployable hospital facility, equipment, and the support necessary to establish the facility" in Liberia. For now, this is the extent of the approved response. The spokesperson was quick to note that additional planning is underway, but emphasised that the Pentagon is responding only to requests made by other federal agencies and taking no lead role. Further, its commitment to the hospital in Liberia, the country most affected by the outbreak, is limited. The Department of Defence "will not have a permanent presence at the facility and will not provide direct patient care, but will ensure that supplies are maintained at the hospital and provide periodic support required to keep the hospital facility functioning for up to 180 days," the spokesperson said. "This approach provides for the establishment of the hospital facility in the shortest possible period of time … Once the deployable hospital facility is established, it will be transferred to the Government of Liberia." On Monday, Liberia's defence minister, Brownie Samukai, said his government was "extremely pleased" by the announcement. "We had discussions at the Department of Defence on the issues of utilising and requesting the full skill of United States capabilities, both on the soft side and on the side of providing logistics and technical expertise," Samukai, who is currently here in Washington, told the media. "We look forward to that cooperation as expeditiously as we can." The current Ebola outbreak has now killed some 2,100 people and infected more than 3,500 in five countries. On Monday, the United Nations warned of an "exponential increase" in cases in coming weeks. Yet thus far the epidemic has resulted in an international response that is almost universally seen as dangerously inadequate. Obama's statement Sunday nonetheless raised questions even among those supportive of the announcement. Medecins Sans Frontieres (MSF), the French humanitarian group, remains the single most important international organisation in physically responding to the outbreak. While MSF has long opposed the use of military personnel in response to disease outbreaks, last week it broke with that tradition. Warning that the global community is "failing" to address the epidemic, the group told a special U.N. briefing that countries with "civilian and military medical capability … must immediately dispatch assets and personnel to West Africa". Yet while MSF has welcomed Obama's announcement, the group is also expressing strong concerns over the president's reference to the U.S. military providing "security for public health workers". MSF "reiterates the need for this support to be of medical nature only," Tim Shenk, a press officer with the group, told IPS. "Aid workers do not need additional security support in the affected region." Last week, MSF urged that any military personnel deployed to West Africa not be used for "quarantine, containment or crowd control measures". The Defence Department spokesperson told IPS that the U.S. military had not yet received a request to provide security for health workers. The United States is not the only country now turning to its military to bolster the flagging humanitarian response in West Africa. The British government in recent days announced even more significant plans, aiming to set up 68 beds for Ebola patients at a centre, in Sierra Leone, that will be jointly operated by humanitarians and military personnel. The Canadian government had reportedly been contemplating a military plan as well, although this now appears to have been shelved. Yet the concerns expressed by MSF over how the military deployment should go forward underscore the fact that there exists little formal guidance on the involvement of foreign military personnel in international health-related response. The World Health Organisation (WHO), for instance, has no broad stance on the issue, a spokesperson told IPS. As the WHO is an intergovernmental agency, it is up to affected countries to make related decisions and request. "Each country handles its own security situation," Daniel Epstein, a WHO spokesperson, told IPS. "So if governments agree to military involvement from other countries, that's their business." Another spokesperson with the agency, Margaret Harris, told IPS that the WHO appreciates "the skills that well-trained, disciplined and highly organised groups like the US military can bring to the campaign to end Ebola." Yet there is already concern that the U.S. military response could be shaping up to be far less robust than necessary. MSF's Shenk noted that any plan from the U.S. military would need to include both the construction and operation of Ebola centres. Thus far, the Pentagon says it will not be doing any operating. While around 570 Ebola beds are currently available in West Africa, MSF estimates that at least 1,000 hospital spaces, capable of providing full isolation, are needed in the region. In a series of tweets on Monday, Laurie Garrett, a prominent global health scholar with the Council on Foreign Relations, a Washington think tank, expressed alarm that the Defence Department's Ebola response was shaping up to be "tiny" in comparison to what is needed.